Some time ago I wrote about “letting go” of my earliest writings (you can read that post here). Just for the record, I still have most of those early writings, slowly rotting away on decades-old onion-skin typing paper. I will eventually let go of them, but only after I’ve scanned them and resigned them to an indefinite existence in the Cloud. 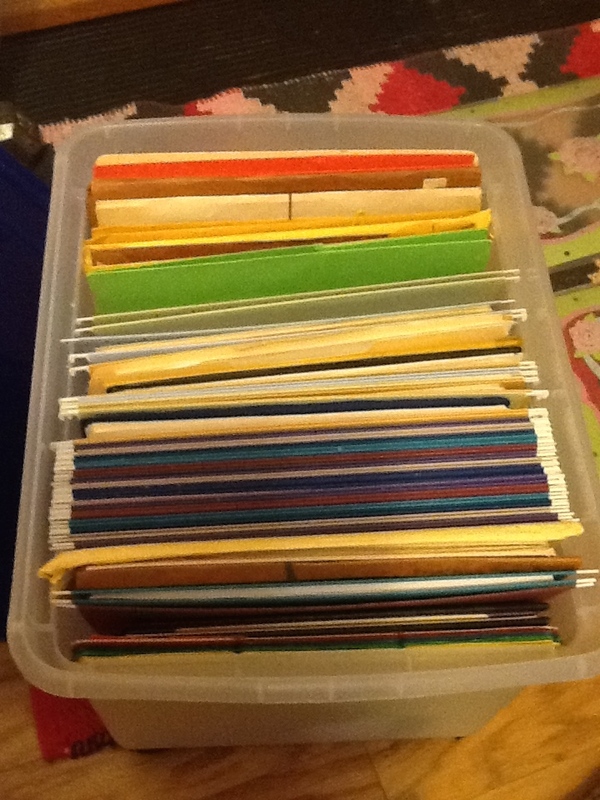 Today, letting go involves leafing through my files, a tidy box of folders, hanging and otherwise. 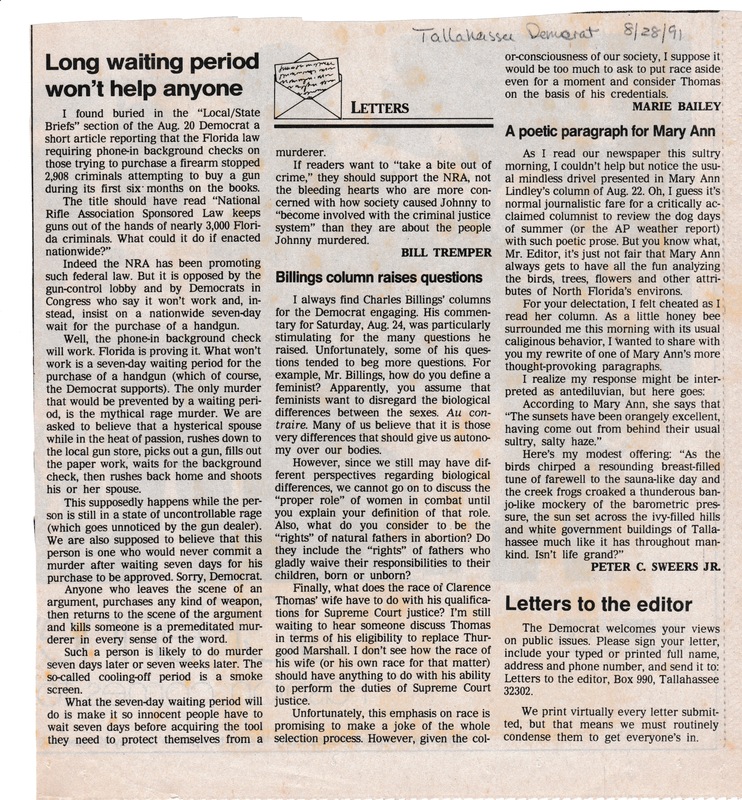 I came across a number of Letters to the Editor that I had written over 20 years ago. There was a theme among a few of them. See if you can tell what got my dander up. I’ll explain at the end. After the excitement of appearing in the WSJ, I had to settle for the local birdcage liner. 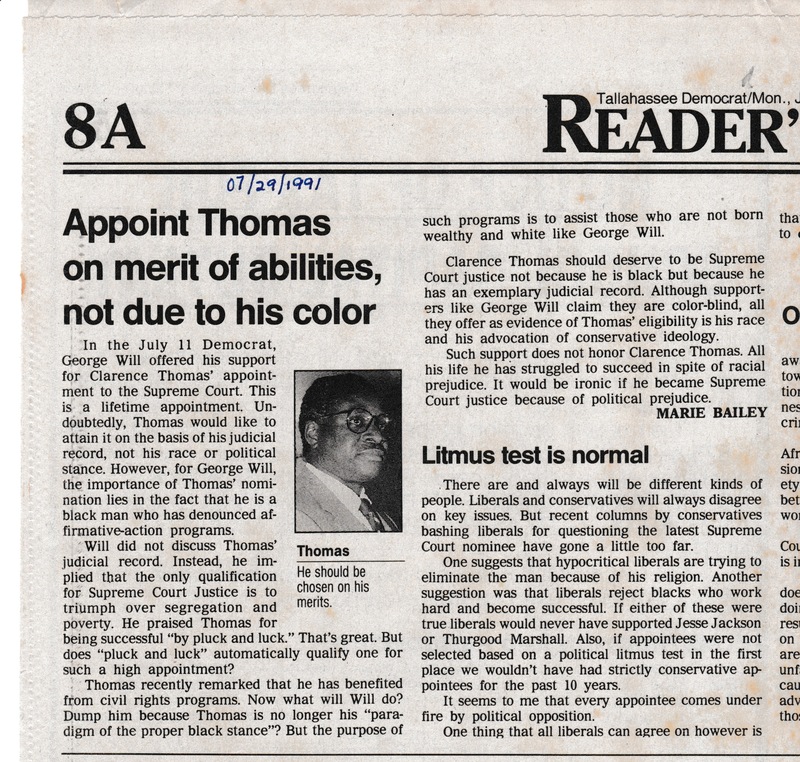 In case you either didn’t want to read these rather off-color (as in ocher) newsprint copies or you tried but the resolution strained your eyes, here’s the bottom line: I was unhappy that Clarence Thomas was nominated for Supreme Court Justice. On August, 28, 1991, I was even more unhappy that, as I say in the above letter, “I’m still waiting to hear someone discuss Thomas in terms of his eligibility to replace Thurgood Marshall.” Over twenty years later, I’m still waiting. 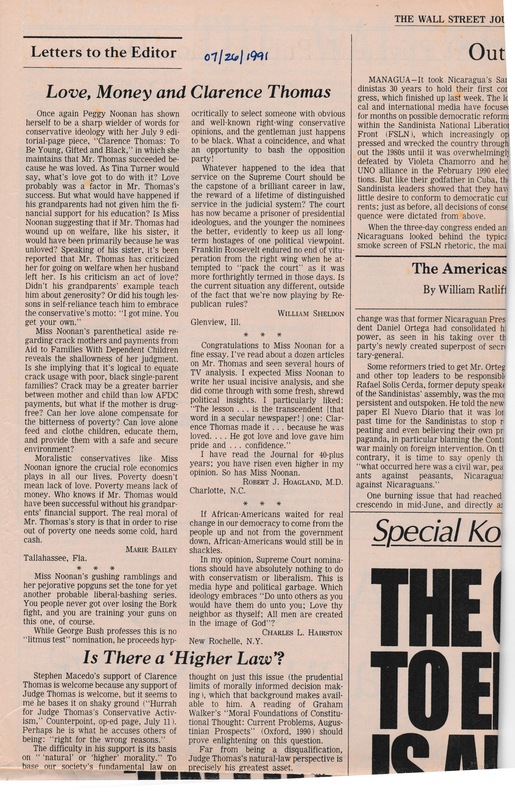 This entry was posted in Writing about writing and tagged Affirmative Action, Civil Rights, Clarence Thomas, law, Letters to the Editor, nonfiction, op-ed, opinion writing, politics, Supreme Court, Supreme Court Justice, Tallahassee Democrat, Wall Street Journal. Bookmark the permalink. Very cool. I was only 11 when that happened, so I’m only vaguely aware of the Clarence Thomas thing. Hasn’t he been a quiet judge that simply votes and keeps his mouth shut? I keep forgetting he even exists. [I feel so old ;)] Yup, Charles, he is the quiet one. I read somewhere that he’s spoken up maybe once or twice in all the years he’s been on the Court. His posture suggests to me that he’s already made up his mind about the cases and doesn’t need to entertain an opposing opinion. Maybe they should make it that a judge has to talk a little for each case. At least to prove his alive or of sound mind. If he’s sitting there thinking about how his shoes taste in ranch dressing then it might be good to know about that. Great letters. I could not agree more. This is awesome. You are a true voice in the sea of voices. Would we even know if he was senile? Oh that’s right, we already do. You and Charles are cracking me up with your comments! Honestly, the man doesn’t even realize it when he contradicts his own self. We’d get along famously in person. Oh man, I was glued to those hearings that year. It was one of the first signs that our country was psychopathic and headed for the loony bin — you know, where we are now! Terrific letters, though. You did us proud! I have to disagree with Kevin…..our country has always been psychopathic. But I’ve always been in awe of people who can write letters to the editor and actually get them published. I once got an ode to my girlfriends published in the local paper for Valentine’s Day. (Friend-friends. Not love-friends.) Nothing highbrow like the WSJ.